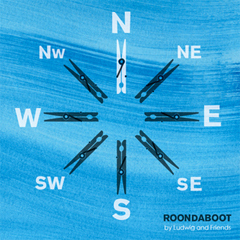 Roondaboot, by Ludwig and Friends, is collection of short incidental pieces, plus the playout song, from Matt Hulse’s feature film Dummy Jim. Following the journey made by deaf cyclist James Duthie into the Arctic Circle in the early 50s, the film has taken the past 13 years to complete. Although the original score by The One Ensemble and Sarah Kenchington was released in 2009, as the film subsequently developed it became clear that further incidental pieces would be required, hence this 12-minute mini-album.